Heather, Floyd, and Orion have been in Massachusetts for the past 9 days -- the house is strangely quiet. I miss them, but I don't miss the chaos. Solitude is therapeutic sometimes. So I've pretty much been focusing 100% on work. It's really amazing to be back. I feel like I'm picking it right back up and accomplishing a lot. I've also been heavily involved in this year's annual Light the Night Walk -- The Leukemia & Lymphoma Society's annual big fund raiser to fight against blood cancer. In fact, I'm Captain for Team Salesforce this year. I'm trying to raise $100k by getting scores of people to walk and fund raise. Want to walk with us? Click here! 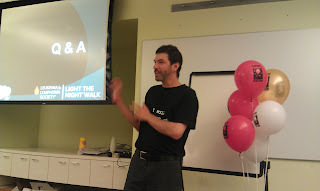 I've been doing these kickoff prezos, telling my story, and rallying the company to support the LLS. I've never really had a cause before. Now I have one. In case you're wondering, anyone can join our team -- you don't have to be a Salesforce employee. You just have to walk 2 miles (flat, easy, super inspiring, fun for the whole family) and raise a little money (it's soooo easy -- you get your own personal online fundraising page with a URL you can mail to your friends.) Here's a short video of what it's all about. C'mon, watch the first 60 seconds of it. Kareem's in it! Head for the shelter! Oooo! Gimmie shelter! The High Speed wasn't in good shape, but the Cyclone ("Riiiide, the ferris wheel!") was. Surprisingly absent were Pinbot and Taxi -- two of my other favs. More than half the floor were sported way old games (from the 50s and 60s). It was cool to see the history, but I really didn't care about playing those. I also rode about 9 miles on Tuesday -- round trip to Little Arrows to play piano for the kiddos. It actually wasn't bad, and I made good time. It was hot though -- I think morning/evening rides to/from the Ferry are going to be doable soon. Maybe next week. That's it for now. Go Phillies. Great post! 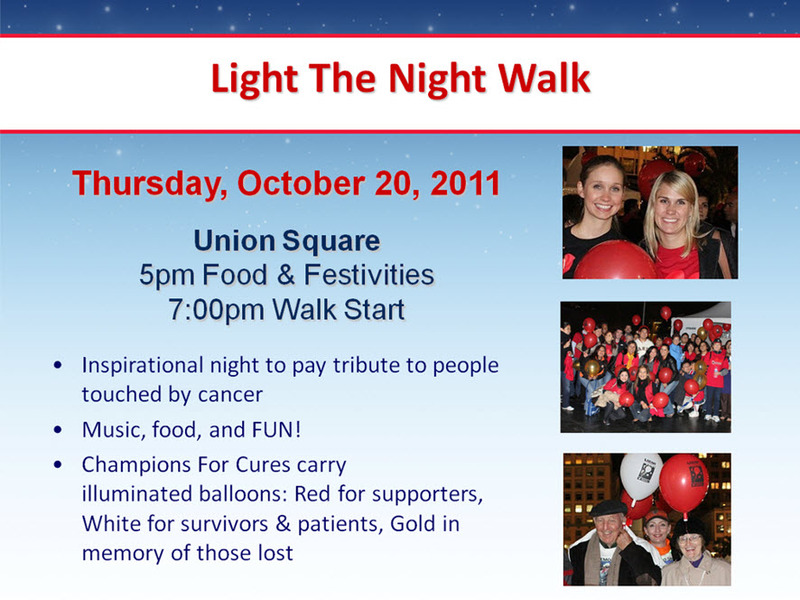 Good luck with the Light the Night Walk!! Awesome to hear about the walk. We will put it on our list for a small donation. 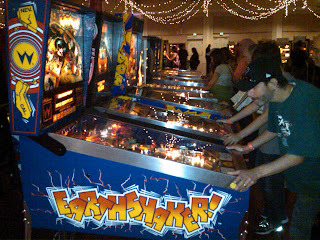 I love that your three favs are all from the Campus Center at UMass - Earthshaker was the best. Similarly, we just went to a GAME 2.0 exhibit at the science museum in Portland - an interactive history of video games. Basically, a chance to play tons of games from different eras. I was left behind over 20 years ago with Galga. Dude - great Furthur show last Friday in Eugene - be sure to give a listen. I love reading your blogs John, they are inspiring and interesting too. 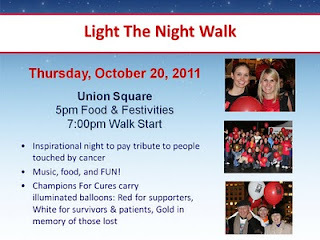 :) I will bring up the Light the Night Walk with my wife. It sounds like FUN! Oh yeah, so long as the Giants are out, I am secretly rooting for the Phillies (and one other AL team who just advanced past the Yanks!). The post season is already super exciting!